Egg Dosa is a street food and served in road side open tea shops. Have not tasted it from outside. But when ever i make dosa my hubby always wants to finish it with an egg dosa. So i learnt to prepare the recipe. Initially i was doing simply by adding eggs,onion , seasoning with pepper and salt. But then i have added my twist to feed my kid in a healthy way. This recipe also turned out really well. My son too kind of liked it and i guess, he felt like he was eating an omelet. I was twice happy that i fed him a dosa, an egg and also some veggies in a single simple dosa. So satisfied that i had fed Carbohydrates Proteins, Fats, and other Nutrients what ever kids need together at one time in a single dosa. Easy to make healthy dosa with out any effort. It does not require any dip, serve with sambar or chutney if you want to. Crack an egg in a bowl and beat well. Then add each a teaspoon of onion, carrot, beans and half a teaspoon of coriander leaves a pinch of each pepper and jeera, and add salt to taste. Heat the dosa pan and grease the pan with half a teaspoon of oil then add a big ladle full of batter and spread in circular motion to make a dosa. Sprinkle half teaspoon of oil and allow to cook for 15 seconds. once the bright white colour of the batter turns dull white add the egg mixture and spread well. 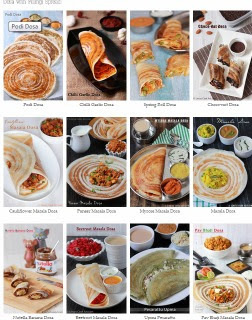 If you need to, then turn the side of the dosa and cook the opposite side too. But it is not necessary if you chop vegetables very finely. Grease the pan using half a teaspoon of oil and add a big laddle full of dosa batter and spread into circular motion. Add half a tespoon of oil on top of dosa. Crack an egg on top of dosa after the bright white colur of the dosa batter turns to dull white. Slightly turn the dosa pan to spread the egg white slightly all over the dosa without disturbing the yolk. 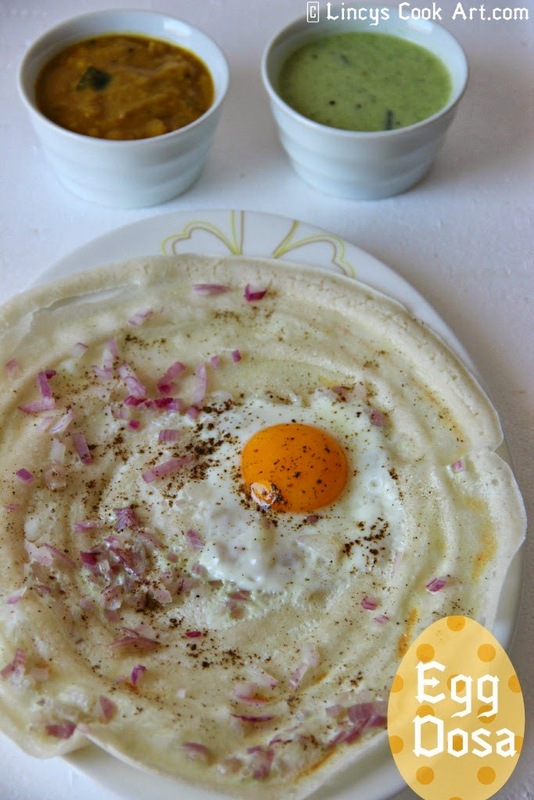 If you want like omelet using a spoon or laddle just slightly mash the yolk and spread with the white and spread all over the dosa without damaging the dosa. Sprinkle salt and pepper on top of the egg dosa. Sprinkle chopped onion on top of the dosa. If you are not turning the dosa and cook the opposite side then cover with a lid and cook the egg layer on top of the dosa. Looks really good.. With veggies and eggs it becomes healthy too. Love this dosa! Looks good! 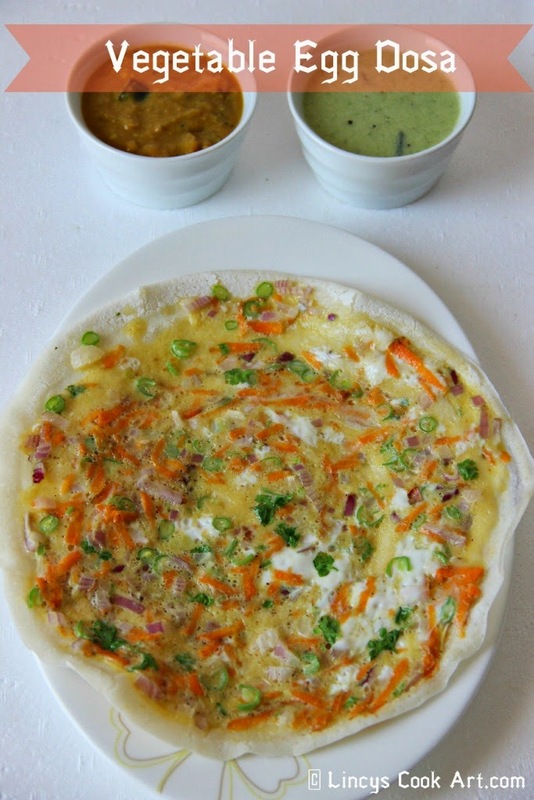 delicious dosa with veg stuff!!! Very delicious vegetable dosa and egg dosa. I will try it next time. its a really interesting way to add vegetables in dosa...sounds delicious! nice dosa and would make a healthy breakfast..